We Heard You … and A New Free Read! 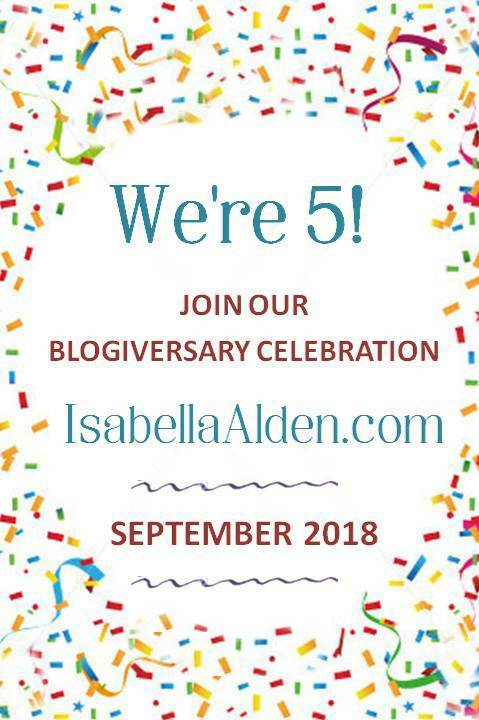 A few months ago, Mary (a reader of this blog) asked us to figure out a way to make Isabella’s Free Reads available so they could be read on her Kindle. Up until that point, we were publishing Isabella’s Free Reads only as Adobe PDF files. Four months later, we think we’ve come up with a solution. Beginning today you’ll be able to download new Free Reads to your Nook, Kindle, iPad, or smart phone directly from BookFunnel! And for those readers who like to view Isabella’s stories on their computer or print out a copy to share, you’ll still have the option to download an Adobe PDF file from BookFunnel, by choosing the “My Computer” option. Ready to give BookFunnel a test drive? Let’s kick things off with a story Isabella specifically wrote for children. Isabella delighted in teaching children important lessons from the Bible. Every issue of The Pansy, a bi-weekly magazine she edited and wrote for, included two or three children’s stories she wrote to convey Biblical truths in an entertaining way. In 1889 her twelve-part story “Helen the Historian” appeared as a series in The Pansy. The story showcases Isabella’s skill in telling a Bible story as a child would tell it. Helen may be only eight years old, but she knows all about God’s love. She’s happiest on Sunday mornings when her young friends gather about her and listen to the Bible stories she tells. And maybe—if she tells the stories well enough—those Bible stories will make a difference in lives of her young friends, too. Now you can read “Helen the Historian” for free! Just click on the cover to be directed to BookFunnel, where you can download the story in the format of your choice. Depending on the format you choose when you download your copy of “Helen the Historian” from BookFunnel, you may be asked to enter your e-mail address. 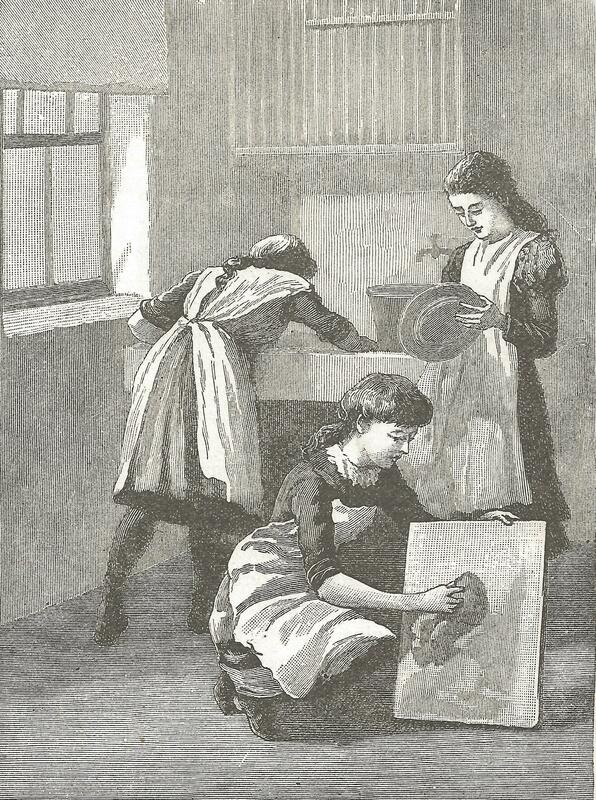 Isabella’s novel Twenty Minutes Late was first published as a serial in The Pansy Magazine in 1892. 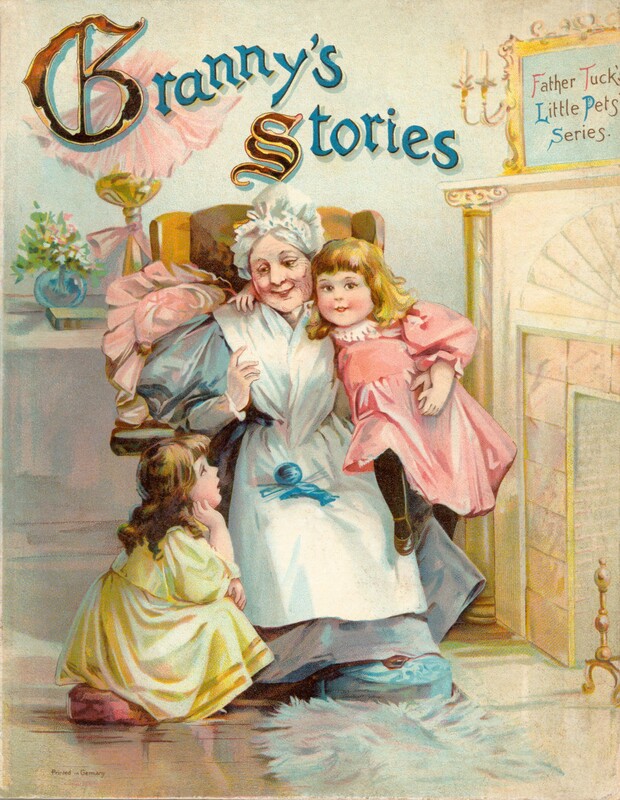 Isabella originally named the story “Way Stations,” referring to the unexpected train trip one of the characters—Caroline Bryant—takes in the story. Twenty Minutes Late is the sequel to Miss Dee Dunmore Bryant (which also began life as a serial in The Pansy), and follows the fortunes of the Bryant children as they learn to trust Jesus as their savior and friend. Isabella often test-drove her novels by publishing them as serials in her magazine; then she made final edits and adjustments to her stories before they were published in book form. You can find out more about Twenty Minutes Late and read sample chapters from the book by clicking on the cover image. One of the most interesting features of The Pansy magazine was the way it promoted The Pansy Society. 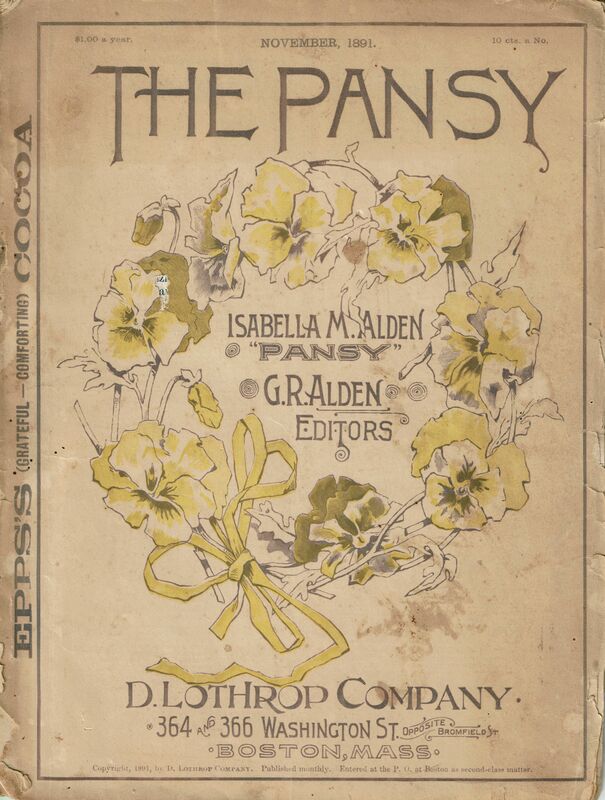 Isabella Alden organized The Pansy Society as a children’s version of the Christian Endeavor program that had taken teens and young adults by storm in the 1880s. Asking Jesus to help me, I promise to try to overcome the fault which oftenest tempts me to do wrong. This fault is _______. Thousands of children filled in the blank for themselves, thereby pledging to harness their temper, obey their parents, be patient, read their Bible, or say only kind words. I will do it for Jesus’ sake. 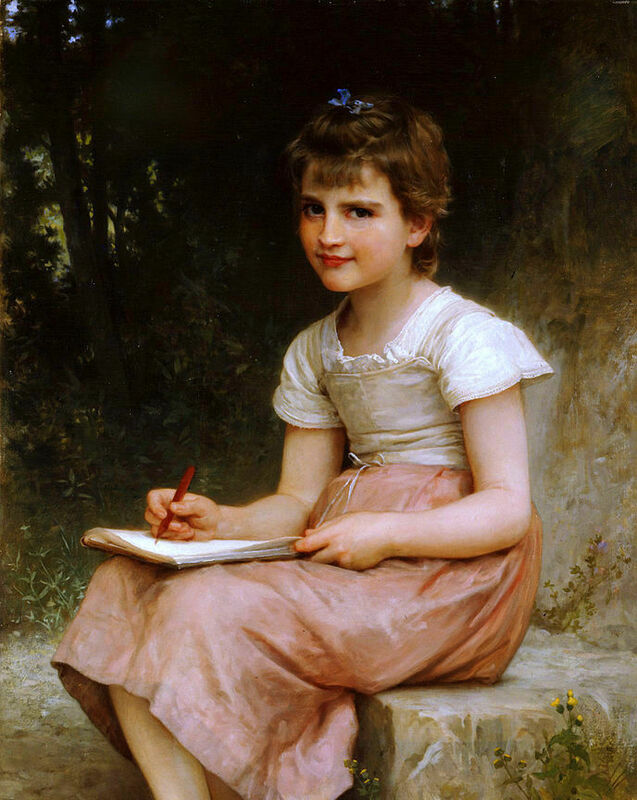 Thousands of children wrote to tell Isabella they whispered “For Jesus’ sake” regularly to keep them on the right path. Every child who joined The Pansy Society received a membership card, personally signed by Isabella, and a badge to wear. Isabella encouraged Pansy Society members (she often called them Pansies or Blossoms) to find other members in their neighborhood, and hold meetings to encourage each other in overcoming their faults and doing good for Jesus’ sake. 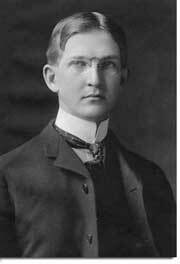 Isabella’s brother-in-law Charles Livingston (Grace Livingston Hill’s father) wrote a novel called The Poplar Street Pansy Society that told the story of the good accomplished by children who formed their own local Pansy Society. I live in Winona, Minn., and I have heard little girls grumble because they don’t live in a big city, but that is not right. I give my old Pansy books to a poor little girl across the street. She is sick, and she is trying to be a Christian; I will help her all I can. We have a little sister younger than ourselves, and she gives away sometimes to fits of temper, and says little naughty words, but since she has seen our badges, and has been told that we are going to try to be good boys, she begs to wear a badge, and says she wants to be good, too. Mamma asked her to say the pledge after her this morning, and she said it so sweetly. “I will do all the dood I tan.” Won’t you please enroll her and send her a badge, too? Her name is Vivian Allen. Your Pansy magazine has helped me to lead a Christian life. Mamma likes to have sister Ruthanna and me help her about the house, and I do not enjoy it very much, so I nearly always grumble and try to get out of it. So I will try to overcome this, with Jesus’ help, and do my work cheerfully. Parents wrote letters, too, sharing stories of changes in their children’s behavior, all due to their child’s membership in The Pansy Society. It was rather a sour-faced little maid who got on the train by herself at Glenburn station. She had on a brown suit, brown hat and gloves, and carried a brown basket. But she didn’t look half so pleased as you would expect a little brown sparrow of a girl to be when she was going on a journey in a nice plush-lined car, through a beautiful country. “Only to Midvale,” answered the little traveler shortly. “A thousand miles!” exclaimed Polly; and as soon as she forgot herself and began to be interested in somebody else, the ugly look took itself off somewhere, and you began to see that Polly had a sweet, bright face, and actually two dimples. Her companion soon found out that Polly was pouting because her mother had gone to Philadelphia, and instead of taking her, had sent her to Midvale to stay with Aunt Mary. Mother did not seem to be to blame, as there was fear of scarlet fever in the square to which she was going, but that did not keep Polly from being cross about it. But Polly wasn’t listening to this little sermon. To her surprise there were rows upon rows of little boys and girls about her own age in the car. 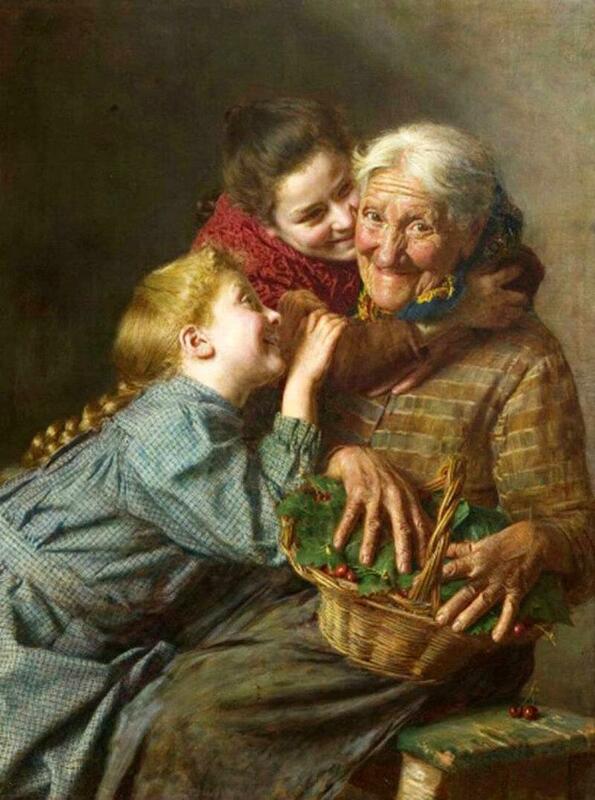 “Aren’t they coming back to their fathers and mothers?” asked Polly, her lips beginning to tremble a little. The tears were beginning to run down Polly’s cheeks at the thought of all that these little children had to do without. The Friend laid her hand lightly on the little brown-gloved fingers. “Has thee ever seen a lesson-book?” she asked. “Yes, ma’am,” answered Polly, in surprise. 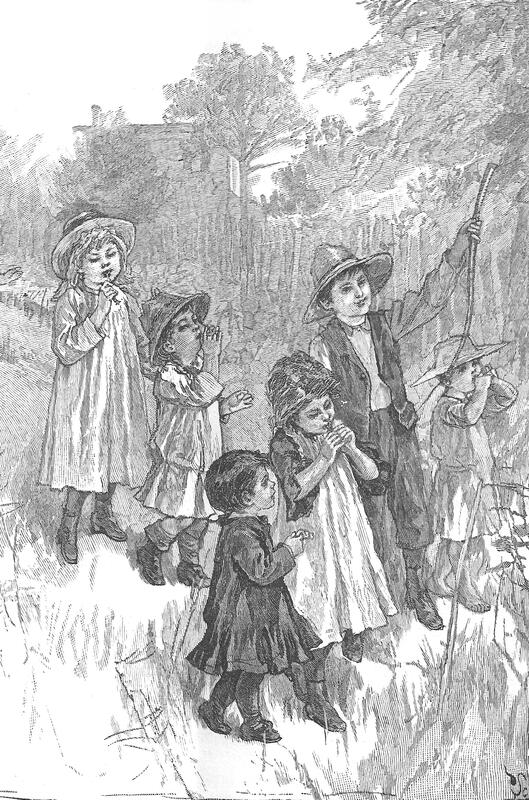 Hastily, Polly slipped off the plush seat, and picking out a pale, grave-looking child, she put the heavy basket in her hand, smiled a good-bye under the Quaker bonnet of the old lady, and here was Midvale. And for a long time to come, when mother felt Polly’s arm close on her so tight that she could hardly breathe, she knew she was thinking about the old Friend, and her rows and rows of motherless children. All of the black and white illustrations in this post came from original issues of The Pansy magazine. Follow this link to Rollins College archives for an example of a note from Pansy. 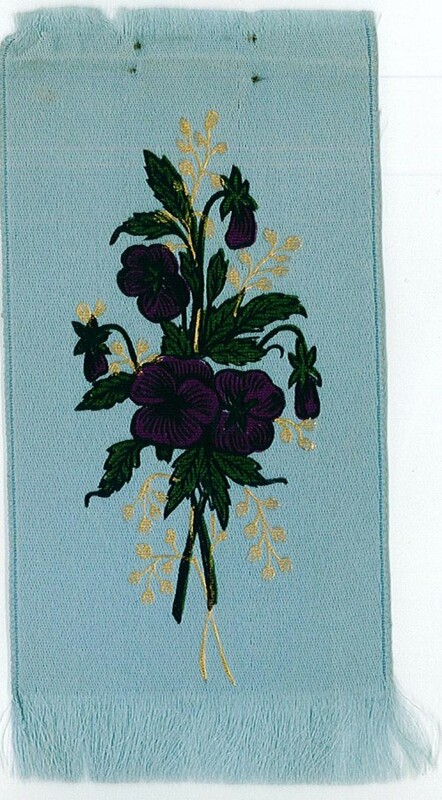 You can read more about The Pansy Society. Click here to read a previous post. Isabella Alden’s first published book Helen Lester was written as an entry to a contest . . . which she won! Isabella’s prize was a check for $50 and publication of her book Helen Lester in 1865. Her son, Raymond, was also a writer. Like his mother, he began writing at a young age. As an associate professor at Stanford University in California he authored several text books. 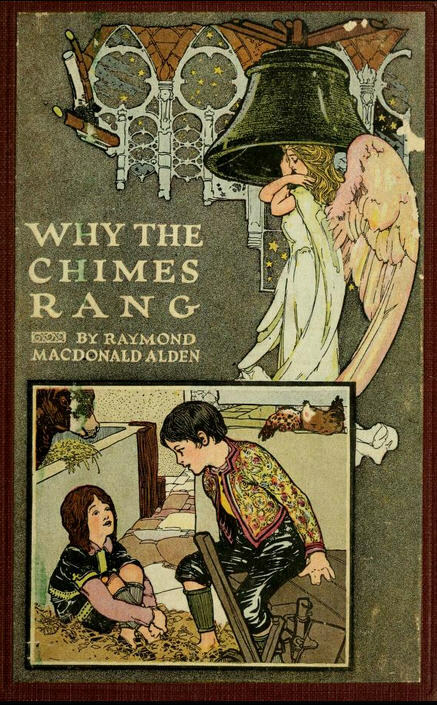 He also contributed stories to The Pansy magazine, which his mother edited; and in 1909 his Christmas book for children, Why the Chimes Rang, was published. Forty years after his mother took her first writing prize, Raymond entered a writing contest. 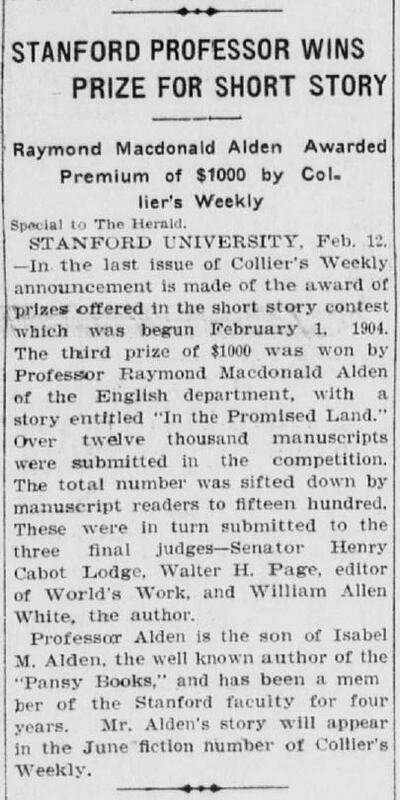 In 1905 he submitted a short story titled “In the Promised Land” to a writing contest sponsored by Collier’s Weekly magazine. His short story took third prize in the national contest and Raymond was awarded $1,000. That was a substantial prize—the equivalent of $26,000 in today’s economy. Click here to read an earlier post about Isabella’s prize-winning book Helen Lester.